The detail steps of mycobacterial isolation in our study are described below. The skin sample was ground, digested, and decontamination. Then, the specimen is inoculated to the culture plate. Two kinds of culture system are adopted. One is Löwenstein–Jensen medium plate combined with CO2 incubator at 35.0°C–37.7°C; the other one is mycobacteria growth indicator tube (MGIT) medium plate with MGIT 960 system. Positivity for either culture system confirms the presence of Mycobacterium. Thus, further subculture and biochemistry study will be done to identify the species. 7H11 medium plate is used to cultivate the colony. Biochemistry test including niacin, urease, tween 80, nitrate reduction, and arylsulfatase are also performed. According to the colonial phenotype and biochemistry results, the subspecies are differentiated., The steps are reformatted as algorithm as [Figure 1] showed. Nontuberculous mycobacteria as a large group of approximately 186 currently recognized unique Mycobacterium species are known have limited impact on human health in the majority., Therefore, it would be more necessary and vital to early identify the species causing infection and harm to life. As the evolution of knowledge to the NTM species identification, we will have clues to approach more and chance to reach an effective therapeutic management in time. Brown-Elliott BA, Philley JV. 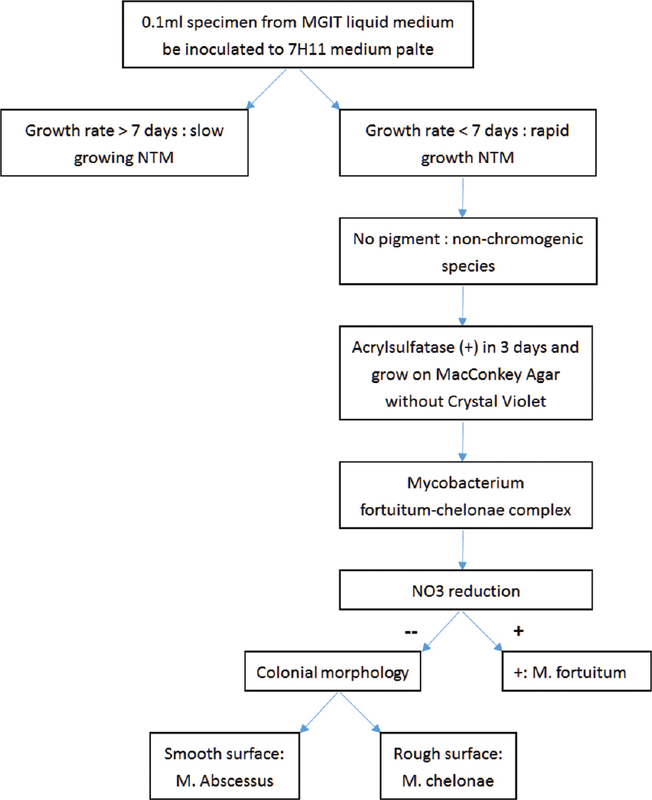 Rapidly growing mycobacteria. Microbiol Spectr 2017;5: TNMI7-0027-2016. Yam WC, Yuen KY, Kam SY, Yiu LS, Chan KS, Leung CC, et al. Diagnostic application of genotypic identification of mycobacteria. J Med Microbiol 2006;55:529-36. El Khéchine A, Couderc C, Flaudrops C, Raoult D, Drancourt M. Matrix-assisted laser desorption/ionization time-of-flight mass spectrometry identification of mycobacteria in routine clinical practice. PLoS One 2011;6:e24720. Choudhury S, Tan YE, Lee WB. MALDI-TOF identification of rapidly growing mycobacteria from fungal media in a biosafety level 2 laboratory. Pathology 2016;48:288-90. Hsueh PR, Teng LJ, Yang PC, Chen YC, Ho SW, Luh KT, et al. Recurrent catheter-related infection caused by a single clone of Mycobacterium chelonae with two colonial morphotypes. J Clin Microbiol 1998;36:1422-4. Cortes MA, Nessar R, Singh AK. Laboratory maintenance of Mycobacterium abscessus. Ch. 10. Curr Protoc Microbiol 2010; Unit 10D.1.1-10D.1.12. Parte AC. LPSN – List of prokaryotic names with standing in nomenclature. Nucleic Acids Res 2014;42:D613-6.